At a TED conference in 2010. Benoit B. [n 1] Mandelbrot [n 2] (20 November 1924 – 14 October 2010) was a Polish-born, French and American mathematician and polymath with broad interests in the practical sciences, especially regarding what he labeled as "the art of roughness" of physical phenomena and "the uncontrolled element in life". He referred to himself as a "fractalist" and is recognized for his contribution to the field of fractal geometry, which included coining the word "fractal", as well as developing a theory of "roughness and self-similarity" in nature. In 1936, while he was a child, Mandelbrot's family emigrated to France from Warsaw, Poland. After World War II ended, Mandelbrot studied mathematics, graduating from universities in Paris and the United States and receiving a master's degree in aeronautics from the California Institute of Technology. He spent most of his career in both the United States and France, having dual French and American citizenship. In 1958, he began a 35-year career at IBM, where he became an IBM Fellow, and periodically took leaves of absence to teach at Harvard University. At Harvard, following the publication of his study of U.S. commodity markets in relation to cotton futures, he taught economics and applied sciences. Because of his access to IBM's computers, Mandelbrot was one of the first to use computer graphics to create and display fractal geometric images, leading to his discovering the Mandelbrot set in 1980. He showed how visual complexity can be created from simple rules. He said that things typically considered to be "rough", a "mess" or "chaotic", like clouds or shorelines, actually had a "degree of order". His math and geometry-centered research career included contributions to such fields as statistical physics, meteorology, hydrology, geomorphology, anatomy, taxonomy, neurology, linguistics, information technology, computer graphics, economics, geology, medicine, physical cosmology, engineering, chaos theory, econophysics, metallurgy and the social sciences. Toward the end of his career, he was Sterling Professor of Mathematical Sciences at Yale University, where he was the oldest professor in Yale's history to receive tenure. Mandelbrot also held positions at the Pacific Northwest National Laboratory, Université Lille Nord de France, Institute for Advanced Study and Centre National de la Recherche Scientifique. During his career, he received over 15 honorary doctorates and served on many science journals, along with winning numerous awards. His autobiography, The Fractalist: Memoir of a Scientific Maverick, was published posthumously in 2012. 2.3 Fractals and the "theory of roughness"
In 1944, Mandelbrot returned to Paris, studied at the Lycée du Parc in Lyon, and in 1945 to 1947 attended the École Polytechnique, where he studied under Gaston Julia and Paul Lévy. From 1947 to 1949 he studied at California Institute of Technology, where he earned a master's degree in aeronautics. Returning to France, he obtained his PhD degree in Mathematical Sciences at the University of Paris in 1952. From 1949 to 1958, Mandelbrot was a staff member at the Centre National de la Recherche Scientifique. During this time he spent a year at the Institute for Advanced Study in Princeton, New Jersey, where he was sponsored by John von Neumann. In 1955 he married Aliette Kagan and moved to Geneva, Switzerland, and later to the Université Lille Nord de France. In 1958 the couple moved to the United States where Mandelbrot joined the research staff at the IBM Thomas J. Watson Research Center in Yorktown Heights, New York. He remained at IBM for 35 years, becoming an IBM Fellow, and later Fellow Emeritus. From 1951 onward, Mandelbrot worked on problems and published papers not only in mathematics but in applied fields such as information theory, economics, and fluid dynamics. Mandelbrot saw financial markets as an example of "wild randomness", characterized by concentration and long range dependence. He developed several original approaches for modelling financial fluctuations. In his early work, he found that the price changes in financial markets did not follow a Gaussian distribution, but rather Lévy stable distributions having infinite variance. He found, for example, that cotton prices followed a Lévy stable distribution with parameter α equal to 1.7 rather than 2 as in a Gaussian distribution. "Stable" distributions have the property that the sum of many instances of a random variable follows the same distribution but with a larger scale parameter. As a visiting professor at Harvard University, Mandelbrot began to study fractals called Julia sets that were invariant under certain transformations of the complex plane. Building on previous work by Gaston Julia and Pierre Fatou, Mandelbrot used a computer to plot images of the Julia sets. While investigating the topology of these Julia sets, he studied the Mandelbrot set which was introduced by him in 1979. In 1982, Mandelbrot expanded and updated his ideas in The Fractal Geometry of Nature. This influential work brought fractals into the mainstream of professional and popular mathematics, as well as silencing critics, who had dismissed fractals as "program artifacts". Mandelbrot ended up doing a great piece of science and identifying a much stronger and more fundamental idea—put simply, that there are some geometric shapes, which he called "fractals", that are equally "rough" at all scales. No matter how close you look, they never get simpler, much as the section of a rocky coastline you can see at your feet looks just as jagged as the stretch you can see from space. One might have thought that such a simple and fundamental form of regularity would have been studied for hundreds, if not thousands, of years. But it was not. In fact, it rose to prominence only over the past 30 or so years—almost entirely through the efforts of one man, the mathematician Benoit Mandelbrot. Mandelbrot used the term "fractal" as it derived from the Latin word "fractus", defined as broken or shattered glass. Using the newly developed IBM computers at his disposal, Mandelbrot was able to create fractal images using graphic computer code, images that an interviewer described as looking like "the delirious exuberance of the 1960s psychedelic art with forms hauntingly reminiscent of nature and the human body." He also saw himself as a "would-be Kepler", after the 17th-century scientist Johannes Kepler, who calculated and described the orbits of the planets. Exploring this set I certainly never had the feeling of invention. I never had the feeling that my imagination was rich enough to invent all those extraordinary things on discovering them. They were there, even though nobody had seen them before. It's marvelous, a very simple formula explains all these very complicated things. So the goal of science is starting with a mess, and explaining it with a simple formula, a kind of dream of science. the name Mandelbrot, and the word "mandala"—for a religious symbol—which I'm sure is a pure coincidence, but indeed the Mandelbrot set does seem to contain an enormous number of mandalas. Mandelbrot left IBM in 1987, after 35 years and 12 days, when IBM decided to end pure research in his division. He joined the Department of Mathematics at Yale, and obtained his first tenured post in 1999, at the age of 75. At the time of his retirement in 2005, he was Sterling Professor of Mathematical Sciences. Fractals and the "theory of roughness"
In his paper titled How Long Is the Coast of Britain? Statistical Self-Similarity and Fractional Dimension published in Science in 1967 Mandelbrot discusses self-similar curves that have Hausdorff dimension that are examples of fractals, although Mandelbrot does not use this term in the paper, as he did not coin it until 1975. The paper is one of Mandelbrot's first publications on the topic of fractals. Mandelbrot has been called a work of art, and a visionary and a maverick. His informal and passionate style of writing and his emphasis on visual and geometric intuition (supported by the inclusion of numerous illustrations) made The Fractal Geometry of Nature accessible to non-specialists. The book sparked widespread popular interest in fractals and contributed to chaos theory and other fields of science and mathematics. Mandelbrot also put his ideas to work in cosmology. He offered in 1974 a new explanation of Olbers' paradox (the "dark night sky" riddle), demonstrating the consequences of fractal theory as a sufficient, but not necessary, resolution of the paradox. He postulated that if the stars in the universe were fractally distributed (for example, like Cantor dust), it would not be necessary to rely on the Big Bang theory to explain the paradox. His model would not rule out a Big Bang, but would allow for a dark sky even if the Big Bang had not occurred. 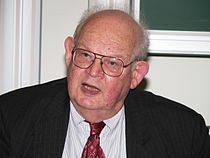 Mandelbrot's awards include the Wolf Prize for Physics in 1993, the Lewis Fry Richardson Prize of the European Geophysical Society in 2000, the Japan Prize in 2003, and the Einstein Lectureship of the American Mathematical Society in 2006. The small asteroid 27500 Mandelbrot was named in his honor. In November 1990, he was made a Chevalier in France's Legion of Honour. In December 2005, Mandelbrot was appointed to the position of Battelle Fellow at the Pacific Northwest National Laboratory. Mandelbrot was promoted to an Officer of the Legion of Honour in January 2006. An honorary degree from Johns Hopkins University was bestowed on Mandelbrot in the May 2010 commencement exercises. Mandelbrot died from pancreatic cancer at the age of 85 in a hospice in Cambridge, Massachusetts on 14 October 2010. Reacting to news of his death, mathematician Heinz-Otto Peitgen said: "[I]f we talk about impact inside mathematics, and applications in the sciences, he is one of the most important figures of the last fifty years." Chris Anderson, TED conference curator, described Mandelbrot as "an icon who changed how we see the world". Nicolas Sarkozy, President of France at the time of Mandelbrot's death, said Mandelbrot had "a powerful, original mind that never shied away from innovating and shattering preconceived notions [… h]is work, developed entirely outside mainstream research, led to modern information theory." Mandelbrot's obituary in The Economist points out his fame as "celebrity beyond the academy" and lauds him as the "father of fractal geometry". Best-selling essayist-author Nassim Nicholas Taleb, has remarked that Mandelbrot's book The (Mis)Behavior of Markets is in his opinion "The deepest and most realistic finance book ever published". In 2004, the American singer-songwriter Jonathan Coulton wrote "Mandelbrot Set". In 2007, the author Laura Ruby published "The Chaos King," which includes a character named Mandelbrot and discussion of chaos theory. In 2017, Zach Weinersmith' webcomic, Saturday Morning Breakfast Cereal, portrayed Mandelbrot. ^ a b In his autobiography, Mandelbrot did not add a circumflex to the "i" (i.e. "î") in his first name. He included "B" as a middle initial. His New York Times obituary stated that "he added the middle initial himself, though it does not stand for a middle name", an assertion that is supported by his obituary in The Guardian. ^ Pronounced /ˈmændəlbrɒt/ MAN-dəl-brot in English. When speaking in French, Mandelbrot pronounced his name [bənwa mɑ̃dɛlbʁot]. ^ a b c Hoffman, Jascha (16 October 2010). "Benoît Mandelbrot, Mathematician, Dies at 85". The New York Times. Retrieved 16 October 2010. ^ a b Lesmoir-Gordon, Nigel (17 October 2010). "Benoît Mandelbrot obituary". The Guardian. London. Retrieved 17 October 2010. ^ Recording of the ceremony on 11 September 2006 at which Mandelbrot received the insignia for an Officer of the Légion d'honneur. ^ a b c d e f g h i Mandelbrot, Benoit (2012). The Fractalist: Memoir of a Scientific Maverick, Pantheon Books. ISBN 978-0-307-38991-6. ^ a b Gomory, R. (2010). "Benoît Mandelbrot (1924–2010)". Nature. 468 (7322): 378. Bibcode:2010Natur.468..378G. doi:10.1038/468378a. PMID 21085164. ^ Steve Olson (November – December 2004). "The Genius of the Unpredictable". Yale Alumni Magazine. Retrieved 22 July 2014. ^ a b c Mandelbrot, Benoît (2002). "The Wolf Prizes for Physics, A Maverick's Apprenticeship" (PDF). Imperial College Press. ^ Mandelbrot, Benoit (14 January 2014). The Fractalist: Memoir of a Scientific Maverick (Reprint ed.). Vintage. ISBN 9780307389916. 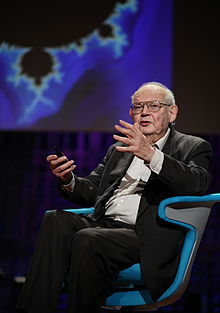 ^ "BBC News – 'Fractal' mathematician Benoît Mandelbrot dies aged 85". BBC Online. 17 October 2010. Retrieved 17 October 2010. ^ a b Barcellos, Anthony (1984). "Mathematical People, Interview of B. B. Mandelbrot" (PDF). Birkhaüser. ^ Rama Cont (19 April 2010). Mandelbrot, Benoit. Encyclopedia of Quantitative Finance. Wiley. doi:10.1002/9780470061602.eqf01006. ISBN 9780470057568. ^ "New Scientist, 19 April 1997". Newscientist.com. 19 April 1997. Retrieved 17 October 2010. ^ a b "Arthur C Clarke – Fractals – The Colors Of Infinity", video interviews, 54 min. ^ Mandelbrot, Benoît; Bernard Sapoval; Daniel Zajdenweber (May 1998). "Web of Stories • Benoît Mandelbrot • IBM: background and policies". Web of Stories. Retrieved 17 October 2010. ^ Tenner, Edward (16 October 2010). 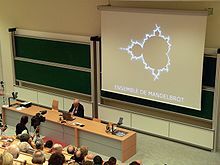 "Benoît Mandelbrot the Maverick, 1924–2010". The Atlantic. Retrieved 16 October 2010. ^ "Dr. Mandelbrot traced his work on fractals to a question he first encountered as a young researcher: how long is the coast of Britain? ": Benoit Mandelbrot (1967). "Benoît Mandelbrot, Novel Mathematician, Dies at 85", The New York Times. ^ Mandelbrot, Benoit B. (5 May 1967). "How long is the coast of Britain? Statistical self-similarity and fractional dimension" (PDF). Science. 156 (3775): 636–638. Bibcode:1967Sci...156..636M. doi:10.1126/science.156.3775.636. PMID 17837158. ^ Devaney, Robert L. (2004). ""Mandelbrot's Vision for Mathematics" in Proceedings of Symposia in Pure Mathematics. Volume 72.1" (PDF). American Mathematical Society. Archived from the original (PDF) on 9 December 2006. Retrieved 5 January 2007. ^ Jersey, Bill (24 April 2005). "A Radical Mind". Hunting the Hidden Dimension. NOVA/ PBS. Retrieved 20 August 2009. ^ "PNNL press release: Mandelbrot joins Pacific Northwest National Laboratory". Pnl.gov. 16 February 2006. Retrieved 17 October 2010. ^ "Légion d'honneur announcement of promotion of Mandelbrot to officier" (in French). Legifrance.gouv.fr. Retrieved 17 October 2010. ^ "Six granted honorary degrees, Society of Scholars inductees recognized". Gazette.jhu.edu. 7 June 2010. Retrieved 17 October 2010. ^ Mandelbrot, Benoit B. (2 February 2006). "Vita and Awards (Word document)". Retrieved 6 January 2007. Retrieved from Internet Archive 15 December 2013. ^ "Benoît Mandelbrot, fractals pioneer, dies". United Press International. 16 October 2010. Retrieved 17 October 2010. ^ "Mandelbrot, father of fractal geometry, dies". The Gazette. Archived from the original on 19 October 2010. Retrieved 16 October 2010. ^ "Sarkozy rend hommage à Mandelbrot" [Sarkozy pays homage to Mandelbrot]. Le Figaro (in French). Retrieved 17 October 2010. ^ "Saturday Morning Breakfast Cereal - Mandelbrot". ^ Mandelbrot, Benoît; Bernard Sapoval; Daniel Zajdenweber (May 1998). "Web of Stories – Benoît Mandelbrot – Family background and early education". Web of Stories. Retrieved 19 October 2010. Mandelbrot, Benoît B. (1983). The Fractal Geometry of Nature. San Francisco: W.H. Freeman. ISBN 978-0-7167-1186-5. Mandelbrot, Benoit B. (1997) Fractals and Scaling in Finance: Discontinuity, Concentration, Risk, Springer. Mandelbrot, Benoît (February 1999). "A Multifractal Walk down Wall Street". Scientific American. 280 (2): 70. Bibcode:1999SciAm.280b..70M. doi:10.1038/scientificamerican0299-70. Mandelbrot, Benoit B., Gaussian Self-Affinity and Fractals, Springer: 2002. Mandelbrot, Benoît; Taleb, Nassim (23 March 2006). "A focus on the exceptions that prove the rule". Financial Times. Archived from the original on 23 October 2010. Retrieved 17 October 2010. "Hunting the Hidden Dimension: mysteriously beautiful fractals are shaking up the world of mathematics and deepening our understanding of nature", NOVA, WGBH Educational Foundation, Boston for PBS, first aired 28 October 2008. Frame, Michael; Cohen, Nathan (2015). Benoit Mandelbrot: A Life in Many Dimensions. Singapore: World Scientific Publishing Company. ISBN 978-981-4366-06-9. Mandelbrot, B. (1959) Variables et processus stochastiques de Pareto-Levy, et la repartition des revenus. Comptes rendus de l'Académie des Sciences de Paris, 249, 613–615. Mandelbrot, B. (1960) The Pareto-Levy law and the distribution of income. International Economic Review, 1, 79–106. Mandelbrot, B. (1961) Stable Paretian random functions and the multiplicative variation of income. Econometrica, 29, 517–543. Mandelbrot, B. (1964) Random walks, fire damage amount and other Paretian risk phenomena. Operations Research, 12, 582–585. Wikimedia Commons has media related to Benoît Mandelbrot. Video animation of Mandelbulb on YouTube, a three-dimensional Mandelbrot-set projection.